aura joon: Ready or Not. For every time I thought of this baby girl as just an idea down the road, or a distant daydream, this weekend she became very real to me. We had an appointment with our midwife and the reality sank in that she could even be here as early as 2 weeks away. It has been sending me into a panicked rush to finish her room, and do all my gardening, Spring cleaning, and organizing before she is here and my life changes forever. Lately, I feel a tight grasp of panic and stress in my stretched-thin minutes. There are never enough hours in the day, and as each one slips by we are one day closer to the first week of April. What will our lives be like? It is only in moments like this one, where I have 30 minutes to eat my breakfast and compose these thoughts, that I realize that whether I like it or not, she is coming. I can't believe I am holding so much fear, excitement, and complete unknown confusion about this tiny little thing that I feel wiggling inside my belly. Are we ever ready for our lives to change that much in one moment? My sister had a beautiful shower for baby girl this weekend. I am so thankful for all our friends and family and all the people who already love her and can't wait to meet her. It makes the stress of my own wandering mind hush a bit, to know that nobody else is worrying about all these changes that are coming. I came home with a car full of beautiful things that I can't wait for her to see. There is a mountain in my living room, and as soon as I get home from work today, I will busy-beeing putting things away and cleaning, once again. We put together her stroller this weekend, bought her mattress and crib bedding, and finally put up her 3 little white shelves we bought in Austin last month. I took all the old frames I've been collecting and had them fitted for glass, added prints I bought off etsy, and found places for them on the empty walls. Every little thing is coming together, and becoming more real by the day. Ready or not, we will meet you soon, baby girl. Every time you post pictures of your house I am completely in awe. I am positive that your daughter will be born into a home filled with love and beauty. Even for us readers, it seems like time has flown by. I feel like you just announced the pregnancy like a month ago! So beautiful. I'm sure you will be naturally amazing mom. you will soon find so much strength hidden with in yourself. right when you think you body and mind can't just CANT do it. you will! do you practice meditation? just remember b i g d e e p b r e a t h s, inhale, exhale. I remember going to my Dr. Hakimian (my persian dr :) and just rattling off all my concerns and he would stop me hid sentence and say, "habibi, big deep breaths, relax... go home and do some yoga and breathe"
I completely agree with what Ashley so beautifully wrote. I am a mom of four- ages 14, 11, 8 and one. The gap between the third and fourth was so large that it felt like we were parents for the first time again and I panicked all the way through the pregnancy- I worried that I would not know what to do with her once she came. I worried that she would not fit into our family because we had become so used to our patterns of living. But, as soon as she was in my arms- I knew that we were all going to be ok. Your love for your baby just takes over and guides you. You are going to be a wonderful mama. She is going to have such great parents! You made her little space so warm and inviting! My sis is in the exact same place you are. She's due in 2.5 weeks but really - her little girl (her first too!) can come at any moment. She literally just called me to let me know she'd bought the stroller. The last thing she needs to get before little itty bitty arrives. She also has much of the same feelings you have - this little bundle could come at any moment! So exciting. I can't wait to meet my neice so I can only imagine how you and my sis feel. My thoughts for a safe everything and healthy itty bitty are with you! love the photos! I'm so excited for you and your growing family. I can't wait for you to post photos of her home coming! I love all of the colors in the baby shower pictures! And I love how the nursery looks, not matchy-matchy like they usually are. 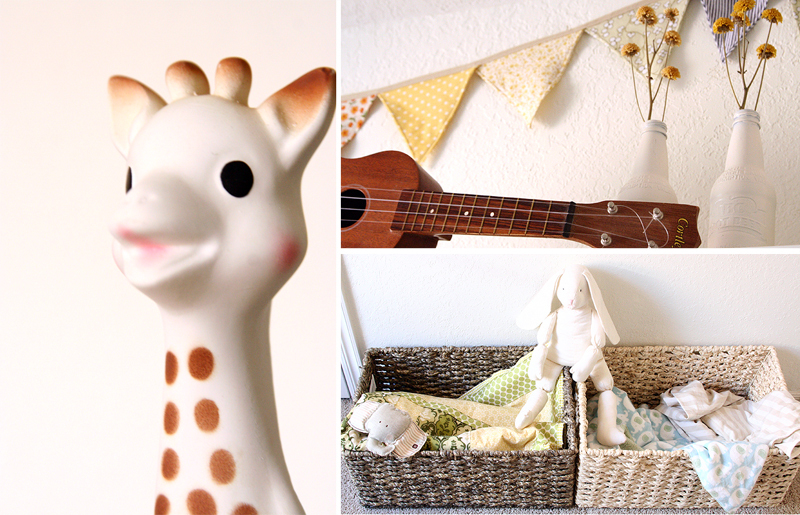 Are you planning on posting pictures of the nursery when it is finished? sophie! we love ours. she has been a good friend through all the drooly, teething moments. and as for, "are we ever truly ready?" - i'd have to say, for me, at least, no. i read the books, and listened to the advice; and then when my tiny beast showed up, i held him with tired arms and an empty mind. and the hugest smile upon my face. even now, one of my favorite sayings when the unexpected comes up, is, "that wasn't in the book"
almost 20 months later and we couldn't be happier and more content with how well everything is turning out. thinking of you as you count down to meeting your little bird, and wishing you all the best. I felt so anxious and unprepared for a child during my first pregnancy and after my daughter was born. I was so worried I would break her or that something terrible would happen. I hadn't changed a diaper in 10 years, had hardly even held a baby, and wasn't particularly fond of babies. The only reason I didn't give up on breast feeding (minus the research that it's so good for baby) was that I hadn't a clue how to even make a bottle. To say I was a nervous wreck was an understatement! Fast forward five years and my daughter is a happy, sweet, well adjusted child who is, SURPRISE to me, not broken! You will make mistakes and unplanned things will happen but you will both come through them in one piece and better for it. The most important thing is love and you, your husband and your family have plenty of that to give. You are going to be a GREAT mama! This time is so exciting and....scary. Remember to be in the moment - don't try to look too far into the future, and definitely don't dwell on the past. I'm so happy for you and your family! Aura - what a lucky baby girl! You are going to be such an amazing mother. 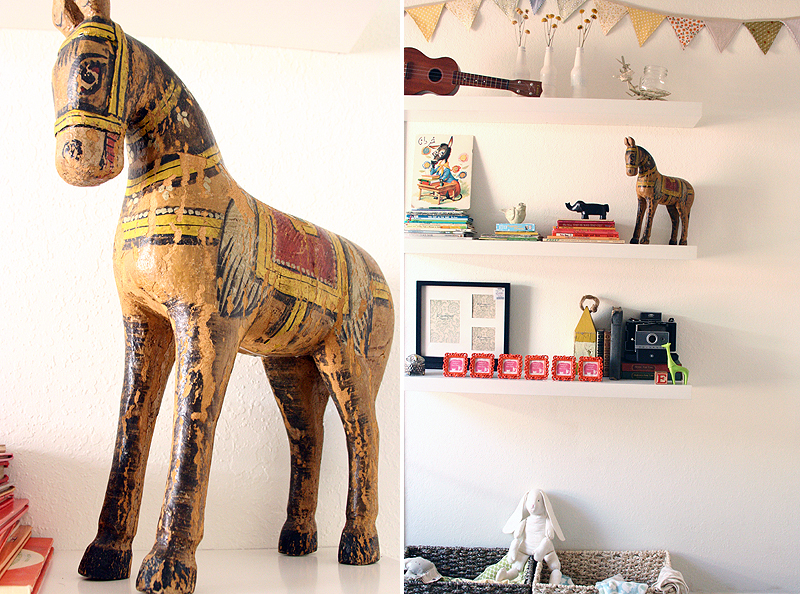 The nursery is so special - I love stacks of books and the earthy tones. This post was so wonderful! The precious girls room looks amazing! So colorful and lovely. This is such a precious time in the weeks before the baby arrives. You can tend to feel a little crazy running around playing a game of "beat-the-clock" to get everything done. I remember that feeling, I distinctly remember painting our bedroom exactly a week and a half before Layla arrived and 2 nights before she was born on my hands and knees scrubbing baseboards until they shown like the sun :) Don't worry, everything will fall into place, and when you see that beautiful little face for the first time, everything all the worries and rushing will fall away. Lots of love girlie! Take care and keep us updated when you can! P.S- :) Did you make the bunting or did you purchase it? It's adorable! Wow it definitely must feel so really now that your down to the last couple of weeks! I am sure that no one ever feels ready and that you can never prepare enough but you will do just fine I'm sure. Except for those women on that "I Didn't Know I was Pregnant" show, I think every person who's about to welcome a child, or children, must have such a mixed bag of emotions about the future. The whole process of expanding one's family is both scary and exciting all at once! Congratulations again, Mama and Papa! Wow - I can't believe how soon it will be that you will get to meet your little one. I am sure that when she arrives, all those anxieties will disappear and everything will seem easy and natural. Good luck! I cant wait to see her room. Your house is always amazing and beautiful to me. I don't think anyone is ever really ready for parenthood. It just sort of sneaks up on you and you manage to figure it out. Your nursery looks warm and welcoming. I love the colours. I bet you can't wait to see your little miss. I just gave birth 5 days ago, there's nothing like seeing your child in the eyes for the very first time. I balled. what a lovely nursery. the bunting is perfect. I am really feeling for you! I have never and am not close to having a peanut of my own, but the beautiful thing about your writing is that you inject so much of yourself into your posts, and I am finding myself feeling your feelings vicariously. I think all your loyal readers feel like we're coming to the crescendo of an amazing journey along with you, and are nervous and excited right along with you! Happy thoughts! 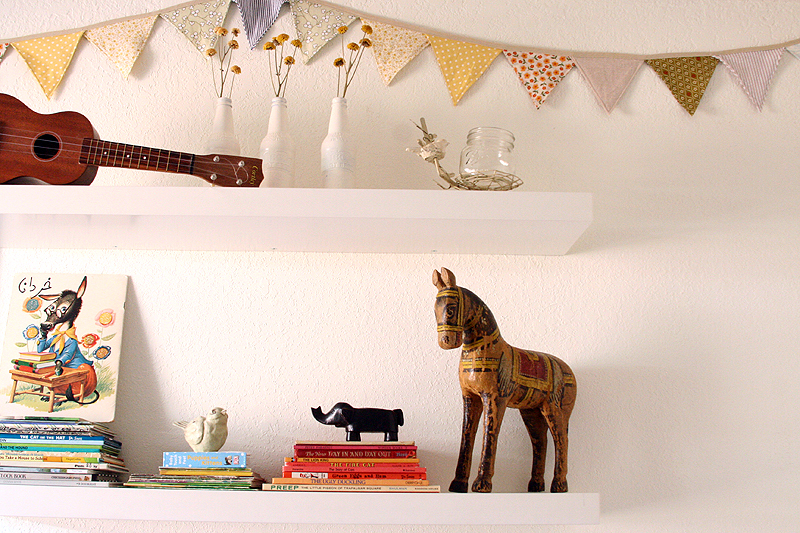 The nursery looks amazing - did you make those adorable flags? I can't wait to see more. What a beautiful post! Having a baby does change life in ways that one can't imagine. I remember being in the same place you are now before my baby arrived. I had never fully understood what people meant when they said having children was the most difficult and also the absolute most wonderful thing you could do in life. How true that is! There are some days I hardly have time to brush my hair or clean the house or whatever, but it's okay. As corny as it sounds, I never knew how much my heart could love (and what true unconditional love was for that matter). I will say that those first few weeks are tough, but it's okay to ask for help. I didn't do that the first time around and wish I had. Enjoy nesting! Ok, Miss. Aura, You are giving me some serious baby-brain! Thanks for the nursery pictures. She is a loved baby I can tell. I lnow you guys are excited and I'm so happy for y'all! Aura, I know exactly what you mean. Even in my last week, I am still busy beeing around and trying to finish things up around the house to prepare for this life changing moment. I often think that ready or not she is coming and my husband and I still can't wrap our minds around something so huge. I don't know if we ever will be able to...but we're excited and I'm sure you are too :). p.s. her room looks gorgeous! I'm over the moon for you, sweet Aura. I can't even imagine all the intensities you're feeling, but don't let the worry and wonder of tomorrow steal the joy of today. Everything will be perfect, just you wait and see. This is too cute! I love it. What a lucky baby girl. The best welcome ever!!! 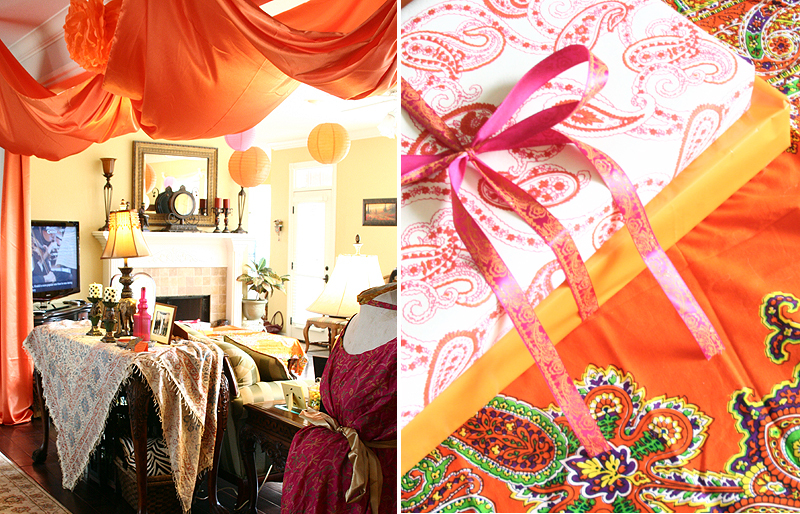 Such a Great Images!those bunting are adorable and lovely...love the amazing space for her,you made it well! So exciting for you and for family! By the way, your photos of your travels are incredible. I love them! I never knew Oklahoma had such a beautiful landscape! I think you're probably more ready than you imagine. and your lives will continue to be as wonderful as they have been, just with a lovely new addition. :) Enjoy it! The first month was the worst for me. It was not fun, it was hard and scary and overwhelming and it felt like I would never be a good mother. I can't even describe what an awful feeling it was to think that I couldn't be a good mom after looking forward to it for so long. People don't tell you how hard it having a newborn is. But, the hormones and routine start to settle, the chaos starts to clear and you see that everything is ok. Now Eli seems to grow bigger every time that I look at him and it feels like he's been with us forever. I find myself wanting to go back to those first few weeks that I wasn't a fan of in the beginning. There's no perfect way to do things, there is your way. It may take awhile to figure out what that is but, once you do, you're going to realize that your daughter never doubted that she has the best parents in the world. I'm sure that is so scary to try and be ready to be a mommy to a little person! You seem to have such a zest for life, crafting and adventure that I am sure your little girl will have a great mommy. It seems like the best parents are those that are interested in their children and have lovely things to teach them. I'm sure the changes are scary as you think about them. You will be able to fit in the things you find important ;). I hope this blog is one of them! I love it! You've created such a beautiful little space for her. I know you and Michael will be amazing parents. It will all be ok! You have done a wonderful job. I absolutely love it. Honestly I do not think we are ever ready for something like this, but once those little ones arrive, our lives are changed for the best. We just welcomed our little boy last Thursday. It is the greatest feeling in the world. Hope everything goes well for you and cannot wait to her stories and see pictures of her. Wow, that is one blessed baby! She is so loved, and you are so fun to share in your excitement. I think the days I had my babies were the most fun days of my life. Congrats to you, and do not stress. Your life is going to change, but in a much calmer and open way that you could ever imagine! major congrats and safe delivery. Beautiful baby room. i dont know why i didnt find it sooner!!! your baby girls space is amazing..she is so lucky!! Only two weeks left? I've been following your blog since the post before you announced you were pregnant. I feel like my best friend is going to have a baby, and I don't even know you, lol. Congratulations again, Mama. Can't wait to see how beautiful she is! No one is ever 100% prepared for a child and the change it brings. However, once here, you will never be able to recall a time without her. Did you see the new animal hooks in Anthropologie? They seem like something you would love. The baby's room is too cute...good job! I just stumbled upon your blog & Im in love with it & your style! You are so adorable too :) Im a new follower!